UCLA CEC’s free screening of “American Sniper”: Who Gets to Speak? On Tuesday April 21st, students filed into Ackerman Grand Ballroom for the free screening of American Sniper hosted by the Campus Events Commission (CEC). Yet even before the lights were dimmed one could feel the sense of silent anticipation and the indescribable tension of waiting rooms. A CEC staff member handed out papers with discussion questions, explaining that it contained questions prepared for a critical discussion of the movie. Leading up to the Tuesday screening, dozens of students protested the event on the Facebook event page and the page itself became a forum for discussion. Some students called for cancellation of the event because it ignored the cultural context through which it dehumanized Muslims and Iraqis. 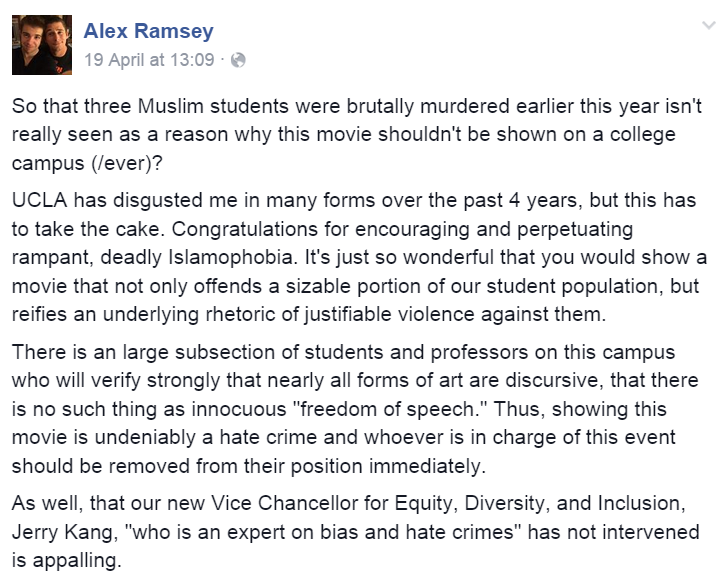 Another student linked to an article about the rise of Anti-Muslim hate crimes after the release of American Sniper. In other words, the students were concerned that the university campus would become a perpetrator in a long tradition of exclusion and silencing of Muslim narratives, specifically in the way the University campus enables problematic discourse which negatively affects minority communities and contributes to a hostile and exclusive campus climate. As a last minute effort, CEC decided to add an optional post-film discussion moderated by Professor Keith Fink, whose background in Entertainment Law already foreshadowed a discussion that defends the right to screen the movie over a more comprehensive, critical deconstruction of the larger context the movie stands for. American Sniper itself shows the limitations of free speech by privileging certain narratives while silencing and eroding others. Before we see any pictures, the screen is dark, ominous and foreboding, while the Muslim call to prayer serves as a backdrop that sounds equally foreign and threatening. It stands on its own to amplify the pressing need for American interference. This first scene sets the tone for the rest of the film … the pressing need to respond to a culture, language and religion which defies translation. When people finally appear into the frame, we see a solider, Chris Kyle played by Bradely Cooper, aiming at a boy and his mother. A montage takes us to see the nuances of Chris Kyle’s background. We see him as a son, brother and husband and the act of killing the boy and his mother becomes an act of self-defense. For the face of Chris Kyle is deep, his history and background minute, we hear his hear beat and tense with every breath he takes as he is about to push the trigger. The Iraqi woman and her son, on the other hand, are seen through the lens of the sniper- they are targets; we do not know their names and we cannot remember their features. While the movie pauses to show us Chris Kyle’s humanity, the city of Feluga has no history or story to be told, its inhabitants, like the Muslim call to prayer, are dangerous and threatening. They too are distant targets with no stories, no brothers to mourn, no wives to wail. But when those fragments of stories do appear they are glazed over, because the narrative of war here is how these acts affect the American soldier and so his targets become nameless. In American Sniper the “other” is not important because she cannot speak. Moving through the houses of Feluga, the army invades into the domestic space and traumatizes women and children who eternally cry and moan in the backdrop of guns, threats and violence. The camera never zooms in on the faces of these women and children because their PTSD is not important, because the “other” is constantly silenced, and the “other’s” body is not a site worthy of it’s own representation. After the movie, which failed to arrive at any of these nuances even at its last moments, the discussion was shaped loosely around why UCLA screened the movie. Students lined up to share their opinions. 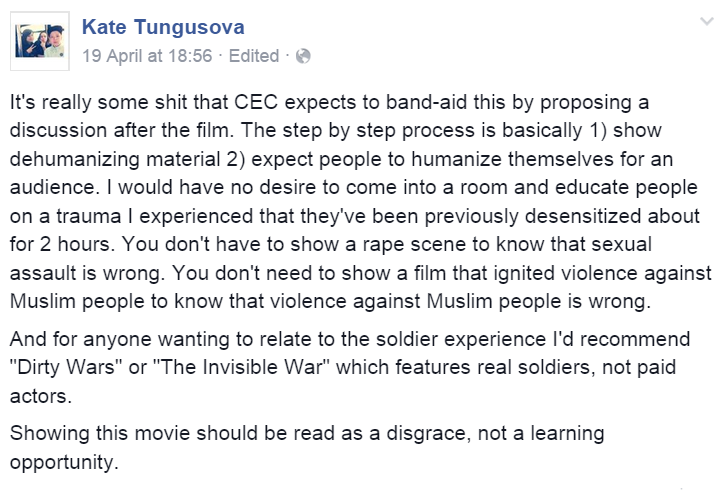 Damali Stenette, a third year Anthropology student whose father served in the army for ten years, voiced her concerns over the way in which the movie dehumanizes Muslims. She proceeded to compare the movie’s problematic context saying: “this movie is not controversial, it is problematic in that it portrays Muslims in a negative way, in the same way Birth of a Nation portrays Black Americans as the ill of American society and the Klu Klux Klan as the savior and hero of America.” When the moderator heatedly retorted that any movie has the capacity to offend, and that even Disney’s Cinderella can be seen as problematic because of their representation of white femininity, a disturbing pattern of silencing the minority was replicated across the discussion space. Sarah Abolail is a third year Egyptian American English major with a minor in comparative literature. She is interested in literature and pop-culture's reflection of social reality. When she's not writing or doing research, she enjoys watching Netflix (over icecream) and deep, life changing conversations. Great piece Sara, super disappointed that CEC chose to show American Sniper and chose an awful moderator for the discussion.